Weibern and Linz, Austria, December 2016 – Is a cow in heat, suffering from a stomach ache or might she become ill? The “Eartag” developed by Smartbow and Linz Center of Mechatronics GmbH (LCM) provides all this information. Changes in the positions of animals and the movement of their ears were recorded, these data were compared with video recordings and then typical behaviour patterns were calculated using algorithms. Now, a special software does more than just record the animals’ position. It also analyses their health. While Smartbow is taking over “entirely untapped, international markets” with the intelligent ear tag, developers are already at work on additional features. The first task for the LCM team was to miniaturise the electronics. This required pushing the tag design all the way to the limits set by the geometry and electrical principles. “We’ve produced a prototype in which the space between the components is reduced to a minimum without limiting performance,” explains LCM Project Manager Erwin Schimbäck. Tracking ended up being just as much of a challenge. The tracking chips in the ear tag transmit blinks (short transmission pulses with timestamps and sensor data) to base stations attached in the stall or the field (anchors). “The algorithm we developed takes data from at least four anchors to calculate the exact position of the ear tag,” explains Schimbäck. However, despite the initial target service life of two years, the commercially available button cells installed in the ear tag depleted after a brief period of use. “We took many approaches to substantially reduce energy consumption,” recalls Smartbow CEO Auer. “Our own development team adapted the algorithm so it can function with less data. LCM reduced the activities of the chip to an absolute minimum and eliminated all extraneous tasks.” As a result, the electronics are not activated until they are attached to the animal’s ear. If the animal remains still, no data are transmitted. In general, the blink rate was reduced from one to two seconds and non-essential components remain off. “Only the real-time clock operates continuously,” explains Erwin Schimbäck. In addition to position detection, the ear tag provides data about the health of the animal. This is done by an acceleration sensor, which registers ear movement. “When an animal is eating, the ear moves differently than when it is drinking or chewing cud. If a calf is feeding from its mother, its ear moves differently as well,” explains Wolfgang Auer. Smartbow engineers filmed the animals during these typical activities and compared these videos with the data from the acceleration sensor. From there, LCM developed an algorithm for detecting patterns, which continues to be developed by Smartbow on a regular basis using data from approximately 27,000 cattle with ear tags. The software records data such as a cow eating less, lying down less frequently, walking more and searching for something. “Then the farmer receives information on his/her computer or smartphone stating that this cow is in heat, should be fertilised and where she’s currently located,” says Auer, explaining a typical notification. Even life-threatening ketoses and broken bones are quickly detected and can be treated immediately. Smartbow is mixing it up in a traditional industry with its ear tag. “We’re definitely the newest company,” says Wolfgang Auer. Most of our competitors have been in the market for decades. In spite of this, or perhaps because of it, business is going well. With a current total of 35 employees, Smartbow generates annual revenues of 35 million euros, and the share of exports is approximately 98 percent. “Russia and the United States in particular have proven to be excellent markets for us,” says Auer. In general, many markets are completely untapped. “In many countries, only two to three percent of companies have a similar system,” says Auer. 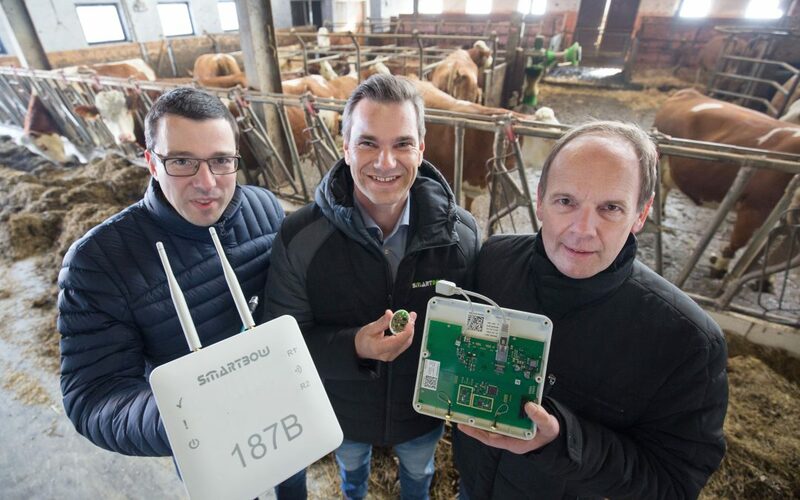 In developed markets such as Holland or Denmark, half of all farmers already rely on tracking and monitoring. “For us, these are easier markets because there is less of a need to explain the product,” says Auer, whose ear tag often replaces systems that are attached to the legs of animals and do not provide much more data than a pedometer.